Under the leadership of CEO Georges Kern, Breitling introduced a new watch collection in the Navitimer 8 on January 29. Launched at a gala dinner in Shanghai as part of a global roadshow—Zurich and New York are its next stops—the watch is a marked departure from the traditional Breitling archetypes. Singapore Tatler Editor Terence Lim joins the party to find out more. Since his appointment as CEO, Georges Kern has rolled out various initiatives to give Breitling a new identity. Its logo has been changed to an old version it used to employ. Its iconic wings have been "clipped" with the brand's initial written in cursive. It is understood from insider sources that the decision is taken to make the brand less masculine and more appealing to a wider crowd. The latest campaign's hashtag is #LegendaryFuture, which explains the brand's strategy clearly—it's taking parts of its rich heritage, making it relevant for the future consumers. An old advertising of the Breitling Huit Aviation Department, which the new collection is based upon. Breitling enlisted the help of watch enthusiast Fred Mandelbaum, who owns hundreds of vintage Breitling pieces, so that the new team could better understand the brand's history. Through the interaction, the team members found out more about the storied heritage the brand boasted—something that Breitling never really touched on in the past. The new Breitling Navitimer 8, whose name is a reference to "huit" (eight in French). 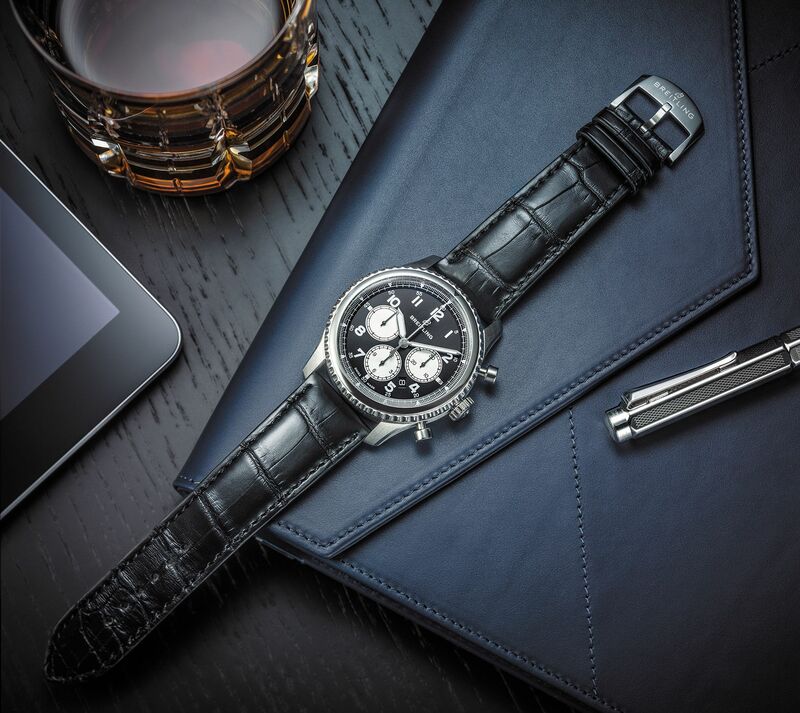 Gone are Breitling's masculine, testoterone-laced and aviation-centric tickers. The Navitimer 8 is a classic, vintage-styled timepiece, which comes slimmer and smaller and in various versions. There are also plans to roll out watches for the ladies in the second half of the year.